Getting traffic from LinkedIn can lead to more sales. Over the last few months I’ve been putting more effort into LinkedIn. The results have been great on a few different levels. Most importantly, we’ve gotten a few customers as a result of more effort on LinkedIn. I’ve been able to make connections that have led to client partnerships. Marketing is always about making sales and growing the business, but with LinkedIn I’ve also been able to learn, to make connections and to get more traffic to the GBW Blog. All those things help to make our business better both in terms of the quality we provide and in the sales we have. In this post we’re going to focus on some of the strategies I’ve had work well to get more traffic. I don’t know if it’s best practice, but it’s been working for me both in getting connections, getting clients and getting traffic. I look to make connections with people that fit the profile of a GBW customer. I try to be strict with this because I don’t to waste anybody’s time. The great thing about LinkedIn is that when you request a connection the other person has the choice to decline or ignore the request. That’s a great feature because if you don’t want to be connected you don’t have to, but maybe if you get to meet each other later you can revisit the connection. Building connections on LinkedIn grows the reach you have when it comes to sharing content, but it puts pressure on you to make that content amazing, which I always try to do. Each business day at GBW we publish blog posts. All those are shared on LinkedIn. I also try to share posts that I find useful. I should probably improve the ratio a bit, but it’s working pretty well right now. Sharing your posts even multiple times each day is necessary to get traffic from social networks. Change the titles up each time. Try to be enticing. How can you not want to watch that? 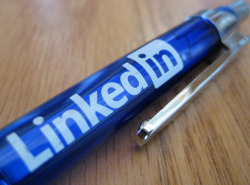 Do that with your articles on LinkedIn (or any social channel) and you’ll get traffic. Groups are interesting on LinkedIn. There are some that are just completely spam or all about sharing articles. I don’t find those valuable and I’m sure a lot of people don’t either. But there are some really great groups where only discussions are allowed. People can ask questions or share thoughts and others can comment. These are the discussions I try to participate in. It’s been going great. You get to meet people, make connections and if you say something interesting you’ll get those people curious about what you do. They visit your profile and your company website. That’s how connections work. If you target the right people and the right conversations you get people interested in your company and they visit your website. That’s traffic. Creating a company page and getting it setup is a great first task, but it’s also important to share your articles on this page each day just as you do with your personal account. You can automatically share your posts via WordPress on your personal account. I haven’t figured out how to do it with the company page yet, but I haven’t been too motivated because I like to change the titles and lead ins as I mentioned above when I share content on social media. Building your following on LinkedIn for your brand will grow your reputation. It has benefits that show others that you’re reputable. It also lets search engines know the same thing, which seems to impact your overall chance to rank well for related search terms. Nothing makes you more happy on LinkedIn than getting someone to like a post you share and having them comment. Pay it forward and comment on other people’s posts. This is part of my daily activities, but I need to be better with it. Each time I do it regularly I find that it makes people feel good, which enhances the connections I have on LinkedIn. It all leads to better connections, more sales and more traffic. LinkedIn is now a regular part of our marketing strategy at Ghost Blog Writers. Each of the five items above are things I try to do each week or each day if I can. They lead to more traffic, more connections and more sales. It’s these little things that make a complete LinkedIn strategy. I’ll also always try new things with LinkedIn to see if there are better ways to do things, but right now these five are what we’re doing to find success.